Excited to introduce my latest It Girl, Donna Garlough: Style Director for popular home décor site, Joss & Main, author of Your Home, Your Style: How to Find Your Look & Create Rooms You Love, voice behind decorating blog, Self Styled, and Charlestown resident! Before we get in Donna's current endeavors, I wanted to share a little bit of her impressive background. Donna started out her career as editor for Martha Stewart’s green-living magazine Whole Living. She then spent a few years covering lifestyle at Boston magazine and freelance writing for various publications, including writing restaurant reviews. Working in magazines is where Donna refined her eye and discovered her passion for introducing people to ideas, objects, and places that’ll add joy and dimension to their daily lives. After a decade in magazines, Donna decided it was time to indulge her passion for design. She had renovated one historic home and was in the process of doing another when joining Joss & Main in 2012. Since then, she's had her hand in many different projects from new brand launches and product curation to photo styling and celebrity room makeovers. Basically anything that has a visual storytelling component or that empowers people to make their homes their own. As Donna waded through this new-to-her world of home décor and design, she started to recognize a gap in the message being given to consumers—lots of “what to do,” not enough “how to do it in a way that works for you.” She also noticed that none of the advice being given to readers and customers took into account how different we are as individuals. It’s not just budgets and awkward-sized rooms that are challenging, it’s also that everyone has different reasons for wanting to decorate their homes. "We’re inundated with inspiration, but are so unsure of where to start, and no one was telling people it’s OK to not be a professional, it’s OK to break the “rules” your parents followed in their homes, and it’s OK for decorating to be a process, not an Extreme Home Makeover," says Donna. "So I came up with this idea of design “dispositions”—something inspired by the mindful-health topics I covered at Whole Living—and the idea really spiraled out from there. What I ended up with was a really fun, happy, empowering real-life guide to decorating that sort of wrote itself." Donna's book (written in collaboration with Rizzoli New York), urges readers to adopt a new decorating truth: whether you are renting or renovating, staying or going, it is always a good time to decorate and the best person to do it is you. Her book is not just a guide to decorating, but a guide to understanding your style strengths, identifying and overcoming your design weaknesses, and figuring out how to put the furniture, decor, and details you love into your home in a way that works for you. 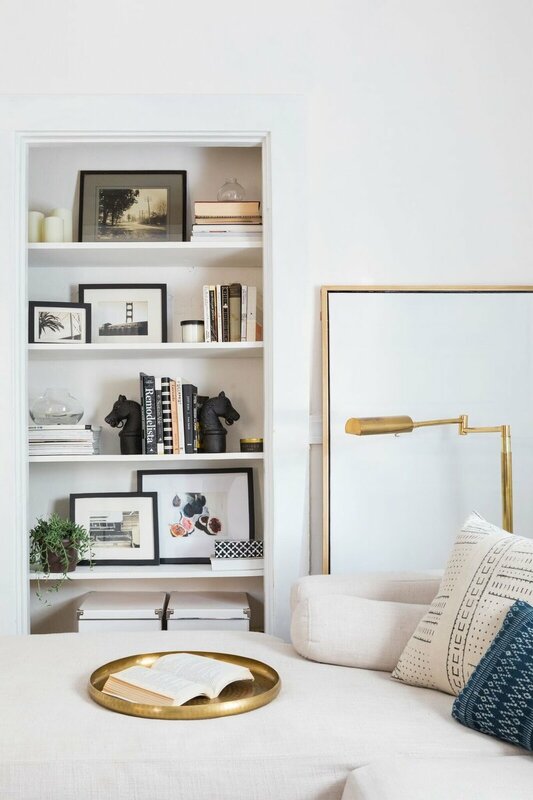 It is also enriched with easy takeaways such as how to style a bookshelf five different ways; how to create a gallery wall — and illustrated with polished attainable spaces styled by Donna herself as well as other home decorators. Being someone who has contemplated writing a book, I was so curious as to the process behind it. "I felt strongly about wanting to go through a traditional publisher rather than self-publishing, and that’s a multi-step process of finding an agent, crafting a proposal, shopping it around, and then of course writing the book. On top of that, all of the photography in my book is original, shot by amazing Boston-based photographer Joyelle West, so there was the process of finding homes to shoot, coordinating, styling, and selecting imagery. There was the graphic design component, and I was lucky to join forces with Laura Palese, the designer who created books for Chrissy Teigen, Gwyneth Paltrow, and more. Oh, and there was the writing! 208 pages is a lot of text, especially when your preferred medium is 250-word blurbs. But the entire process was a blast." In addition to all of Donna's amazing current works, she is also the coauthor of The Green Guide, and has been featured in Real Simple, Family Circle, Country Living, InStyle, ElleDecor.com, People.com, PopSugar, the Wall Street Journal, the Washington Post, and the Huffington Post, among other publications. Is there anything she can't do??? As you all know, I always ask my It Girls what their one piece of advice is for women starting their own business. In this case, I asked Donna what her advice is for women who want to try something new. According to Donna, "Writing a book is no golden ticket. Few things are. I did it because I had something to say, a longtime drive to create something tangible like this, and probably a little bit of a reckless side I needed to indulge. But I had a lot of encouragement, and I chose to listen to the people in my life who were cheering me on—the ones who said “of course you should,” and “so how are we going to get this done?” not “why—what do you want to get out of it?” I knew what I didn’t know, I read up on others’ experiences as much as I could, and then I just started down the path. You want to climb a mountain? Read a map, learn about the terrain, grab some solid boots, and go. And bring a buddy who packs good snacks. Joyelle always had my back with snacks." For interior inspiration, make sure to follow Donna on Instagram. You can also purchase her book on Amazon.